If we buy that definition then “leadership” has actually been a buzzword for quite some time. I’m not sure when it changed from a meaningful word to a buzzword but my guess would be that it happened slowly over time, so slowly that many of us were slow to realize it happened. 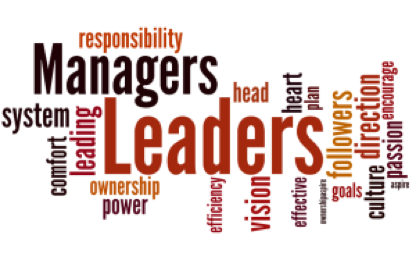 People, including me, have written exhaustively about the difference between managing and leading and yet most people who use the word “leader” when describing themselves still operate more as a manager than a leader. They know enough about leadership to use the buzzwords but when you watch them in action the buzz soon disappears and all your left with is words. One area, one critical area, where many of these would be leaders fall short is in developing and sharing their vision. Authentic leaders understand the importance of goals and having everyone in their organization working towards those goals. A vision describes those goals in some detail and also explains how the strategies, tactics and operational plans of the organization ensure those goals are achieved. The best leaders endlessly clarify the vision and goals of their organization and explain how even small goals can serve to help ensure the larger goals are achieved. That process helps everyone within the organization understand their own role in helping the vision become reality. Here’s the thing; if you’re in a leadership role and you have no vision for the organization then where exactly are you leading your people? If you have a vision and you have not effectively shared it with the people you lead then why would they follow you? People have a need to know where they are going and what will be waiting for them when they arrive. Without that very basic information they are unlikely to actually follow. Leadership is not just a word, it is an action, more precisely a set of actions. One of the actions is developing and sharing a common vision that comes from common goals. If you want to actually practice leadership rather than just talk leadership then share your goals and vision early and often. Repeat it again and again, make it a part of everyday life in your organization. People react to management but they respond to leadership, when it’s truly leadership. Reactive people will seldom help a manager achieve organizational goals but responsive people very often engage with their leader to accomplish great things. Share your vision and your people will respond. Once that happens anything and everything is possible. Here’s an interesting if a bit risky experiment for you. Walk into a room full of people that you have never met and yell out “follow me” and run out of the room. See how many people follow you. Next, walk into a room full of people who know you well, don’t say anything to anyone other then yelling the same “follow me” and then run out of the room. See how many people follow you. I’m betting the numbers will be almost the same. The people who don’t know you may have some disparaging comments about you, then again, so may the people who know you. But the group that knows you may just shrug and wonder what you’re up to now. Both groups however will have this in common: they are unlikely to follow you without first knowing where you’re going. Even people who know you well, they might even trust you, but to follow you they need to know where you’re going. So now let me ask you this. As a leader, do you have a vision? For yourself, your organization and for the people you lead? I hope your answer is yes. Let’s assume that it is. Here’s a second question. Do your people know and buy into your vision? If you’re answer to that question is yes as well, then congratulations are in order. You’re set! You’re also in a very small minority. The sad and challenging reality is that too many, way too many, leaders have an “idea” of where they might be going but have nothing so formal and serious as a vision statement. If you don’t know where you’re going, or can’t articulate it to your people then why in the world would you expect them to follow you? The good news is that you, anyone as a matter of fact, can develop an effective vision statement that shows you and those who you would lead exactly what your (and their) destination looks like. To write a vision statement, focus on the basics of your mission statement and extrapolate; where is your organization, you, or your people going to be five years from now? What will you, your organization or your people have accomplished? In five years XYZ Company will be the leading provider of healthy snacks for unhealthy people. We will do this through our committed employees showing care and concern for every single customer we touch. We’ll “Wow” our customers and competitors alike and we will be a joy to do business with. We’ll work in a supportive caring environment that makes “work” fun and allows no doubt about the fact that XYZ is a great place to work and a wonderful place to do business. We will be a business where every customer is served with a smile and positive attitude. Something like that. Make it meaningful, make it realistic, make it attainable with effort. Once you have a vision statement you must share it with everyone. Your people, your customers, anyone who will listen. You must share it often. If you share it once it will die a quick death. The only way to keep your vision alive is to share it often. Expect your people and anyone else you share it with to hold you accountable to it. While that can be scary it is also a great thing. Accountability will be a huge asset in your efforts to achieve your vision. Above all, YOU must believe and commit to your vision statement. If you don’t then others won’t either. Your vision statement won’t be worth the paper it’s printed on. So, let me ask you again, do you have a vision? If you do then tell the world. You might be amazed how many people will be willing to help you get there.